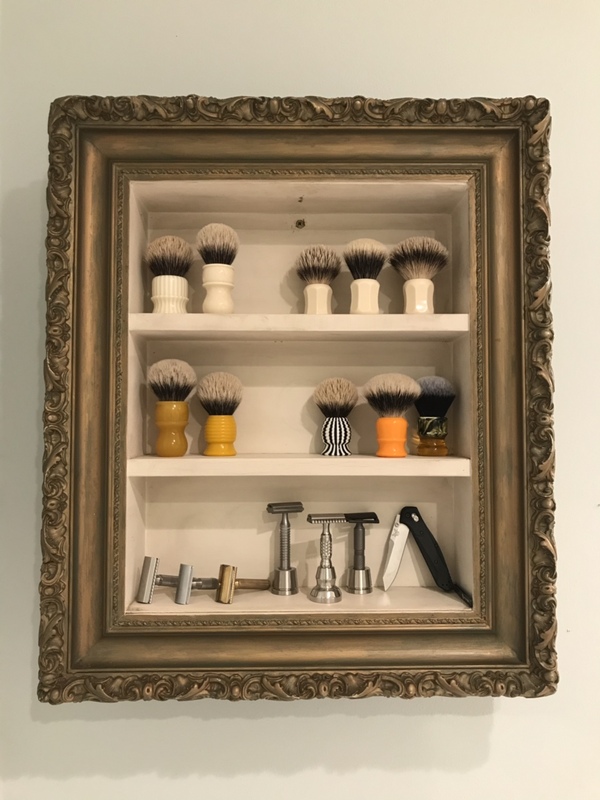 A very interesting approach to displaying shave gear. I'm looking for something for my brushes mostly as they pretty much cover all available counter space by the sink and that really is unworkable. I do have one question though. How do you use the Benchmade for shaving ? (01-29-2019, 11:17 AM)barbe-rouge Wrote: I do have one question though. How do you use the Benchmade for shaving ? I love the picture frame theme. Wow, love that look. Very creative. So much so that my wife MIGHT actually entertain the thought of me doing something similar. Thanks for the inspiration! 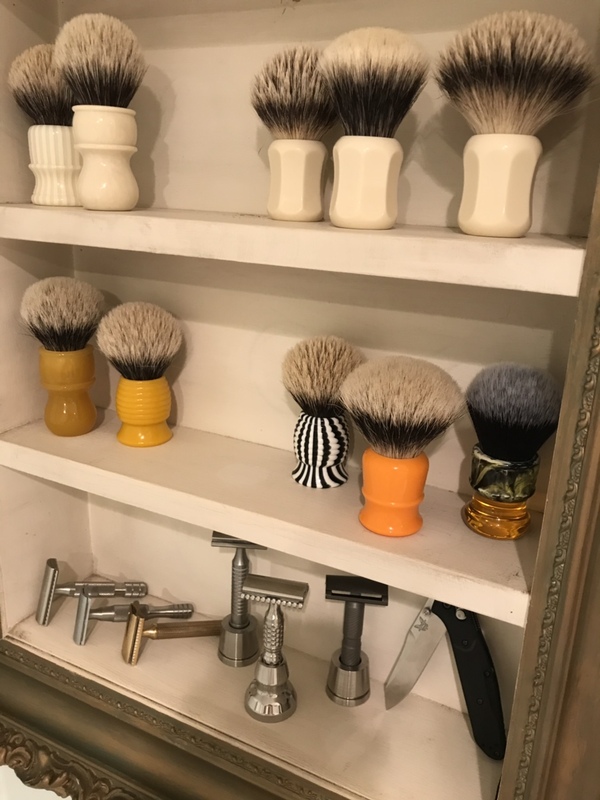 That's a great way to display your shaving gear. Very creative. (01-29-2019, 11:17 AM)barbe-rouge Wrote: How do you use the Benchmade for shaving ? I think we all have the same question here. I couldn't have such a knife in my shave self for absolutely no reason. Your shave self looks nice though. How do you deal with the dust since there is no protective glass? Looks great! Is the shelf unit a repurposed medicine cabinet? Thanks guys for all the positive comments! Believe it or not, I found it at Goodwill for only $12. It’s a very heavy, well made piece. Prior to this, I had a single shelf and it was really starting to get cluttered. The Benchmade is my everyday carry knife and I keep it on the shelf for 2 reasons... so my little kids can’t get it... and so I see it in the bathroom and actually remember to put it in my pocket when getting ready. I have to agree it's very classy. 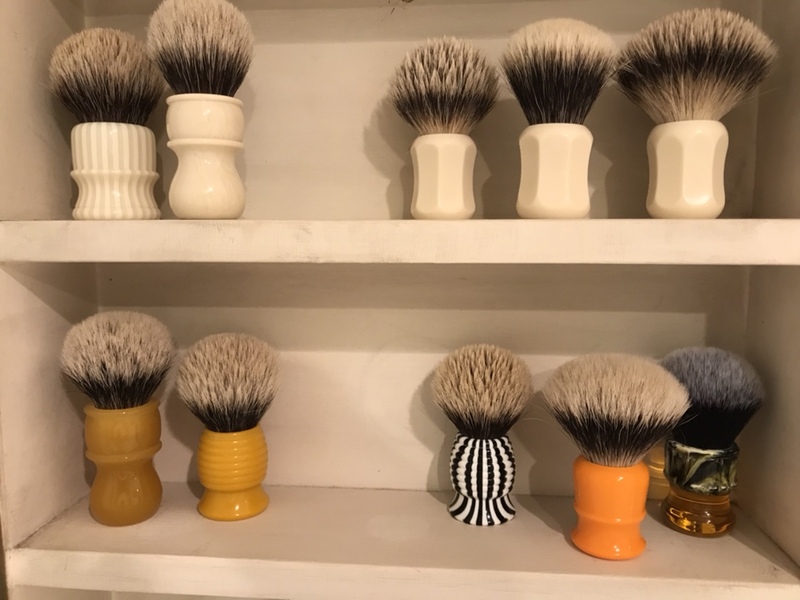 I think I like the zebra handle a lot! Who makes it? (01-30-2019, 03:48 PM)Garb Wrote: I have to agree it's very classy. 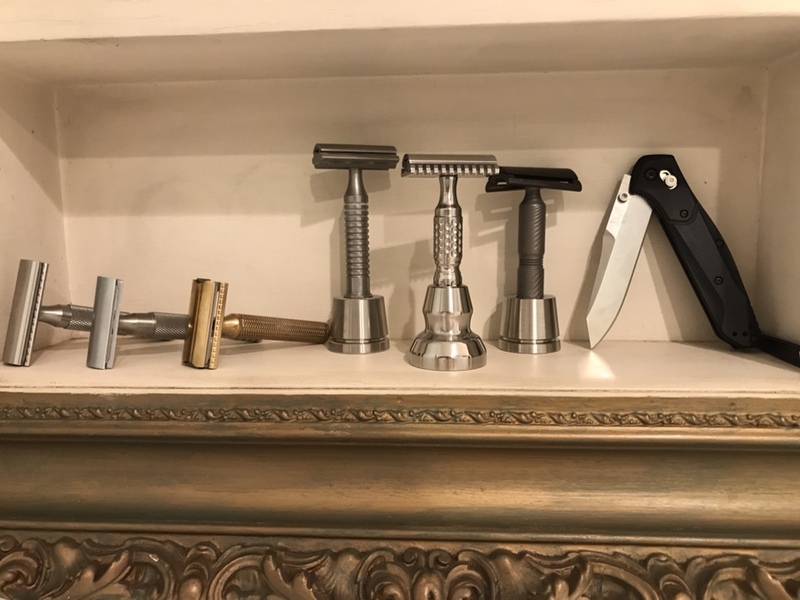 I think I like the zebra handle a lot! Who makes it? (01-30-2019, 02:53 PM)Stubble Daddy Wrote: The Benchmade is my everyday carry knife and I keep it on the shelf for 2 reasons... so my little kids can’t get it... and so I see it in the bathroom and actually remember to put it in my pocket when getting ready. Benchmade and ZT are probably my favorite brands for everyday folders. I really like the Axis lock on Benchmade. You have to work really hard to get the blade to fold on you while using it. The ZTs are nice too, but they are mostly tanks and a bit too heavy to lug around on the chance you may need a knife. Going out for the day and know you'll be using it often then it's ZT. thats pretty cool, i really like the frame. any thoughts about a mirrored back? (02-22-2019, 11:16 AM)global_dev Wrote: thats pretty cool, i really like the frame. Gorgeous shelf with tons of gorgeous gear! (01-30-2019, 02:53 PM)Stubble Daddy Wrote: Thanks guys for all the positive comments!